Illustrations: Bemis House, 267 North St. Illustration: 361 Porter Ave., 390 Linwood Ave. Essential feature: Differing wall textures - Patterned wood shingles shaped into varying designs, including "fish scale"
Illustration: 584 West Ferry St. Illustration: Bemis House, 267 North St.
Illustrations: 406 Linwood Ave., 584 West Ferry St. Illustration: 409 Linwood Ave., 437 Linwood Ave. Illustration: 467 Linwood Ave., 584 West Ferry St. Illustration: The Butler House, 429 Linwood Ave. In Eastlake and Queen Anne styles, carved vergeboards sometimes include scroll-sawn cutouts, bull's eyes, beaded spindles, turned spindles, sunbursts, or (drop) pendants. Named for the early eighteenth-century British monarch, the Queen Anne movement began in England in the 1860s. In that country, the term is associated with the revival and reinterpretation of several various architectural trends and styles which proliferated throughout Britain from the late fifteenth through the early eighteenth centuries. The Queen Anne style in Britain had a wide variety of sources and inspirations from Medieval Tudor-era half-timbered structures, to the more Classical-inspired Renaissance era designs of the Elizabethan and Jacobean periods. Gothic influences were also apparent in the Queen Anne style. This wide variety of historical and constructional sources all merge in the Queen Anne style in the United States. The style is characterized by irregular forms, massing and shapes, and a wall surface which is frequently broken by recesses, projections, towers and bays. The influence of Medieval England and France is reflected in asymmetrical massing; varied, textured and patterned wall surfaces and planes; and the prominent use of overhangs, projections and jetties. One of the most common elements found in both high-style and vernacular examples is the widespread use of patterned or shaped shingles, available in a myriad of shapes and designs. 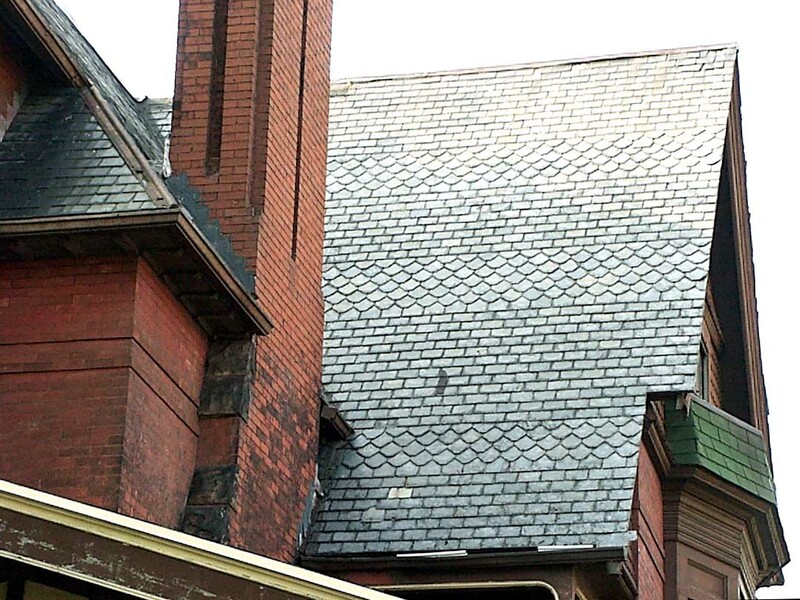 These shingles could be applied to a single element such as a gable or a tower, or could be used more widespread across the building. In some examples, exterior surfaces were covered with multiple materials; stone, brick, slate, terra cotta, stucco, half-timber, clapboard, and shingle. 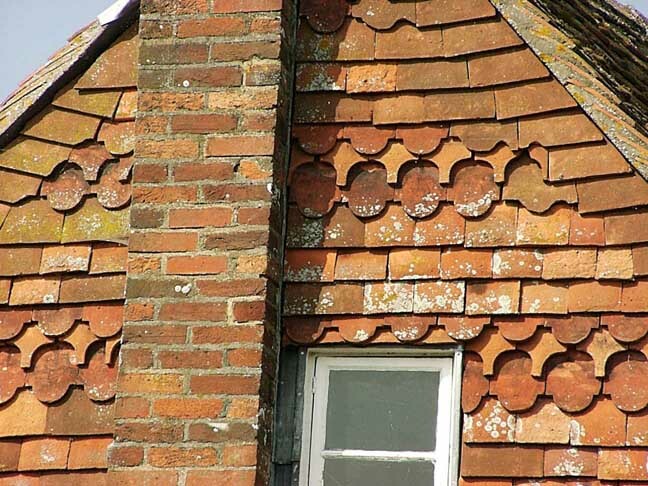 Stucco might be molded or studded with stones or broken glass to emulate the pargeting found on old English dwellings. High hipped roofs and cylindrical or faceted towers or turrets generally with conical roofs brought the forms associated with chateaus, manors, and farmhouses of northwestern and central France to the American landscape. 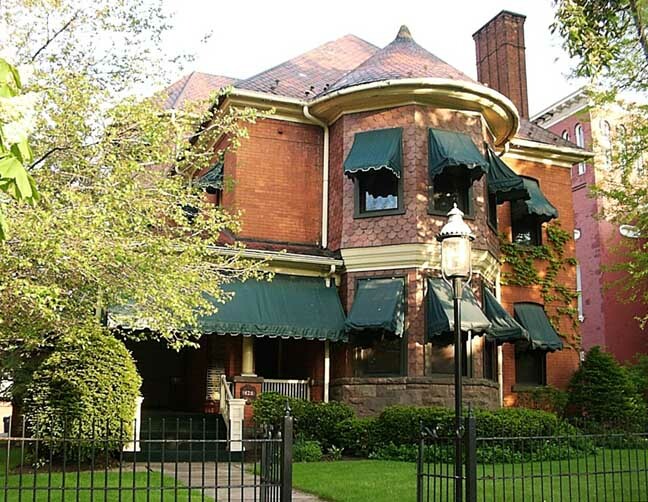 The Queen Anne style was the quintessential American Victorian house with "bric-a-brac" and "gingerbread." It was the dominant style of domestic building during the period from about 1880 until 1900; it persisted with decreasing popularity through the first decade of the 20th century. The style is varied and decoratively rich. 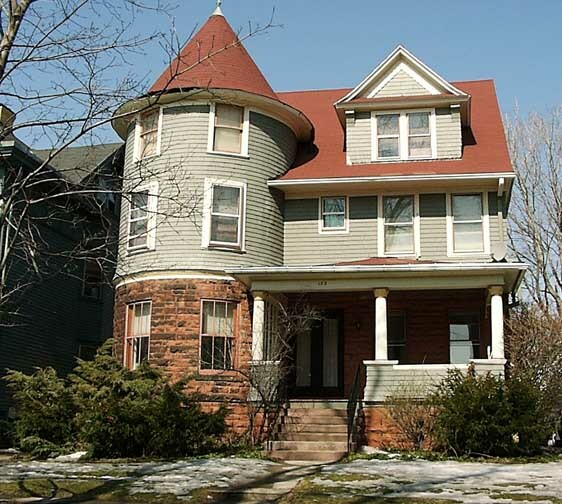 Queen Anne houses often often employed elaborate woodwork of the Eastlake type. At the time of construction it was not uncommon for the houses to be painted with as many as six or seven different colors to bring out all the different textures and trim. The fashion was fairly dark colors, along the lines of what we call today "earth tones" -- sienna red, hunter green, burnt yellow, muddy brown, etc. The style was named and popularized by a group of 19th-century English architects led by Richard Norman Shaw (1831-1912). The name is rather inappropriate, for the historical precedents used by Shaw and his followers had little to do with Queen Anne who reigned 1702-14 or the formal Renaissance architecture that was dominant during her reign. horizontal bands of leaded windows. Basements were abolished, and front gardens had wooden fences rather than iron railings. Shaw designed several small villas in the late 1870s for a new "artistic" suburb of west London called Bedford Park. The basic elements of red brick, white woodwork and features such as porches and oriel windows were rapidly adopted by commercial developers and used into the 1920s. The Queen Anne proved enormously influential in the United States, where it dominated architectural debate and practice from the 1870s. Shaw's style was given two very distinctive American features: an extensive use of wood, for shingle, cladding, verandahs and decorative facade details, and novel, informal planning. One of the most interested American architects was H. H. Richardson. Having studied and worked in France, and from his travels around Europe during the early 1860s, Richardson was keenly aware of the various historical precedents around Europe. Richardson was to do in America what Shaw was doing in England. With the Watts-Sherman house of 1875 in Newport, Rhode Island, Richardson paid homage to some of Shaw's buildings. The Watts-Sherman house was the first American building to be called "Queen Anne." Richardson's growing fame in the second half of the 1870s probably influenced other architects to learn of Shaw's work. The Queen Anne received its first major exposure in America at the 1876 Centennial Exposition in Philadelphia, where the British government constructed several buildings in the style. It caught on quickly and replaced Second Empire and Gothic Revival styles as the most popular of the times..
American architects came to know and admire Shaw's ideas from a book of sketches he published in 1858, and, especially, pen and ink drawings from 1874 in periodicals, including the first architectural magazine, The American Architect and Building News, which were widely distributed in England and in America. Numerous architectural pattern books provided the designs. This architectural style is considered a Victorian era style because, like the British Victorians, reaction to the Industrial Revolution led to reexamination of the pre-Industrial Revolution past. A revival of Gothic style architecture was the first manifestation of this romantic portrayal of the past. Queen Anne became an architectural fashion in the 1880s and 1890s, when the industrial revolution was building up steam. North America was caught up in the excitement of new technologies. Factory-made, precut architectural parts were shuttled across the country on a rapidly expanding train network. Exuberant builders combined these pieces to create innovative, and sometimes excessive, homes. Some of the best known Queen Anne houses are the "painted ladies" of San Francisco. One of the most important technological developments during the second half of the 19th century was the advent of balloon framing, whereby the framework of a house could be made out of uniform lumber; this was becoming increasingly available from commercial mills. The framing system comprised inexpensive two-by-four-inch boards, combined as upright studs and cross-members and held together by cheap, mass-produced nails. 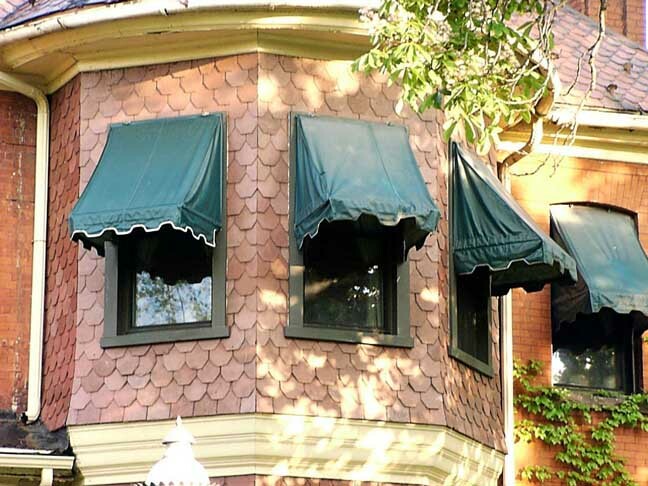 Eventually, by the turn of the century, balloon framing replaced traditional hewn timber construction and simplified the making of more complex architectural features, such as overhangs, bay windows and towers. Advanced manufacturing techniques were also employed to mass-produce finished windows, doors, brackets and decorative turnings, often more elaborate and sometimes less expensive than their handmade counterparts. Along with plentiful building materials,there was also access to an increasing variety of publications on house building: trade catalogues, pattern books and architectural periodicals.